Self Help Skills To Release Pain And End Suffering Through Awareness! Using Traditional Thai Massage Therapy! Practical self help skills that help you to realize, through the action of receiving a traditional Thai massage therapy, how to gain awareness and to recognize and release pain. Learn how to balance your body's energy and return to your natural state of feeling good, the state of well-being. By practicing these health skills often, you're giving yourself permission to heal mental, emotional and physical pain within your body. In addition, you'll learn how to release any negative past memories and/or negative self-limiting beliefs by allowing yourself to take ownership of them. Know of other massage therapies that work? Choose to receive Thai massage therapy often while practicing these self help skills. Then you’ll easily be able to release stress and get in touch with your hidden beliefs. As a bonus, you’ll heal anxiety and depression; take fewer medicines, experience a pain-free body and live in the natural state of joy and well-being. The tools and techniques offered on this self help skills page are not meant to be used as a quick fix for anything. For whatever reasons, due to your resistance you’ve allowed yourself to reach a state in which you’re experiencing physical, mental or emotional pain and suffering. You didn’t reach this unbalanced state overnight and although it's not your fault, you are responsible for creating it. That being said - two things become apparent. First, you allowed it to happen so you can equally and just as easily choose to allow yourself to return to a state of well-being – your natural state. Second, although moving away from well-being may have taken many years, it doesn’t have to take anywhere near as long to reach for and return to the state of well-being again, but it’s unlikely to happen overnight. Please don't fall into the trap of making this a stressful exercise, something that you just "fit-in" between other events of your busy life schedule. In order to get the most benefit from using these self help skills, through Thai massage therapy, it’s always best if your mind is in a relaxed state. It's probably best to allow for between one to two hours for a massage session. And I suggest that you mentally and physically relax for at least thirty minutes before your therapy begins. If possible, make a point of choosing to relax prior to the massage therapy. Before starting this self help skills massage treatment get in the right frame of mind. Make a conscious decision that you will begin to heal yourself through Thai massage therapy. Important Notice: This information is most suitable for people with general aches and pains. If you have obvious or long-term detrimental physical health symptoms, it’s always best to consult with your physician or health adviser. Lek Massage is Highly Recommended. Maenam, Koh Samui, Thailand. Once you've decided to use Thai massage therapy, hold an image of yourself receiving a massage treatment and imagine the feeling of relief you'll feel after completion of the treatment. Then begin looking for a massage therapist. Many of these kinds of Thai massage therapists will be aware of your pain upon contact with the painful areas of your body. And they may offer additional health suggestions not covered on this self help skills page. Genuine Thai massage therapists may ask some relevant questions prior to or during your treatment, but in general they'll remain quiet and will spend their time focusing upon giving the treatment and using their energy in positive ways. 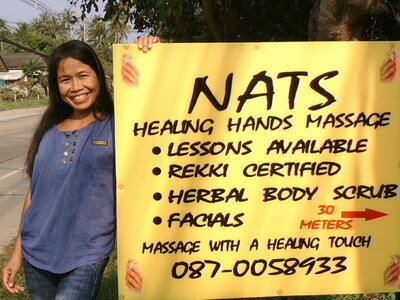 Khun Nat of 'Nat's Healing Hands Massage' Koh Samui, Thailand. You’re lying there receiving a massage treatment and you have a relaxed state of mind. Now close your eyes and bring your attention to the therapist’s hands. Hold your mental focus upon their hands and do your best to stay with their hands as they move from area to area of your body. You’ll become aware that your mind has wandered and that internal dialogue is taking place. In other words you’re mentally talking to yourself. Awareness that your mind is no longer focused upon the therapist's hands is conscious awareness. Simply bring your attention back to their hands and stay focused there. Automatically forgive yourself for losing focus each time this happens. Remember: you're in the process of training your mind to become more consciously aware. And while it may seem difficult to do in the beginning, I assure you that as you practice it’ll become easier. The first couple of times you receive massage therapy, focusing upon the therapist’s hands is all you need to do. Once you’ve become proficient at doing that you’ll notice that, in that moment, there's only awareness of consciousness or energy. Your mind will remain quiet and bodies and hands will be outside of your focus. While you’re focused upon the therapist’s hands wherever they're physically touching your body, you might notice pain in a certain area. If the therapist hasn’t noticed your pain by your "aah" and "ooh" sounds, tell them so that they can spend extra time there. Use Thai Massage to Release Pain. By being consciously aware of your pain, in this moment, forgiving and loving yourself and by holding a clear intention to heal those areas of your body, little by little, you’ll effect a healing within you. Notice that I said: "you'll effect a healing within you?" The massage therapist serves to bring the pain to your attention and effects a healing on the physical level, but your mental action and conscious awareness are the keys to your healing. Providing that you’re using a genuine therapist/healer, their energy will already be balanced and thus vibrating at a high rate. They’ll naturally reflect the state of well-being. And the simple act of being in their presence will cause vibrational resonance and your vibrational frequency will naturally increase and become more balanced. Sometimes, as you’re intending your pain away old memories or repetitive thoughts will surface within you. I don’t believe it’s necessary to spend any time on them initially, just intend to release them in the same way as outlined in the releasing pain section above. Always keep it simple. However, if these newly surfaced memories remain or keep coming up you might need to look at them more closely. Because you might have old beliefs attached to the memories, which are still running automatically (unconsciously) in the background. So digging a bit deeper will be beneficial. Once you have identified the underlying cause of the persistent memory and/or belief you'll be able to release it in the normal way. In this case, examine the memory and ask yourself these questions: What would I need to believe is true in order for this memory to persist? What is this memory telling me? Do I really believe that? 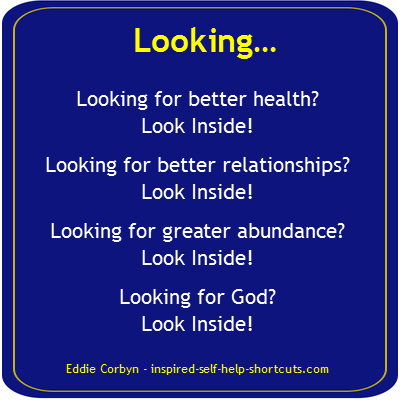 This inspired self help free page goes deeper into identifying and changing beliefs. Releasing old memories while receiving a Thai massage. It’s a good idea not to do anything strenuous or stressful immediately after your massage treatment. A lot of energy movement and healing is still taking place within your body, so it’s best to relax for an hour or so after the treatment. It’s not a good idea to rush straight back into your busy life schedule! Sometimes, other old memories or beliefs may surface after your massage treatment and you’ll have an opportunity to release them too. Being consciously aware of them gives you an opportunity to take ownership of them and the ability to let them go if you so desire to at this time. Once you’ve been receiving massage therapy for a while and have practiced the self help skills covered on this page, you’ll have less pain and suffering in your life. Once you personally know the benefits of combining massage therapy together with conscious awareness you’ll probably make massage therapy a regular part of your life. By the way, I'm sure that other kinds of massage therapy will work just as well as Thai massage, although I'm not personally aware of which ones are most beneficial. The important thing to remember is to choose a therapist who is sincere and thus who wants you to heal. Once you begin healing yourself through conscious awareness you’ll use fewer medicines, visit doctors less, and you'll no longer spend time wallowing in pain and suffering. Since discovering Thai massage therapy more than twenty years ago I’ve hardly ever needed to use western style doctors or medicine. Please submit your tips on this self help skills page. Please Enter The Title Of Your Tip Here! Do you have some pictures or graphics that will add clarity to your tip? Great! Click the button and find the first one on your computer. Select it and click on the button to choose it.